Well, it has been a while, since I posted and I guess I should start with the finish, of the last cruise because many of my dear friends and family have asked for me to do so. So I will do that, now lets see where did I leave off? The captain had warned us the night before that the weather was not going to be on our side today. Sure enough he was correct as we boarded the tenders in the dark, rainy, and windy morning at 0700. We were first off the ship as the rain pelted down. Unfortunately our guide was no where to be seen as we waited in the rain. She did arrive at approximately 0800. We all piled into the van just to escape the continuing rain. Fun, fun! We drove along the coast line from Cannes to Antibes and to the hill top ancient village Biot. The rain didn’t stop, but we did. We all climbed out of the van and walked up the stone walkway into the town. The streets were very small walkways dotted occasionally with wide steps. Partly up into the village we spotted a shop selling umbrellas. Big umbrellas! That was for us. Cindy found a beautiful rainbow colored one, just perfect for the remainder of the day’s travel. After walking through the village we returned to a restaurant at the village gate, it had a big bocce court, right in front. Reminded us of the movie, a Year in Province. We wished the weather had been nice, and the men playing. They were serving a veal reargue’ with peas and carrots for the special. So it was the special with a bottle of wine and French bread and we were warm and dry again. Not much to do in the pouring rain but slowly return to the ship, we would like to return here some day. Once again safely on board to depart for the warmed sunnier Barcelona! The morning began with us sitting on the balcony watching the sun rise. It was beautiful! After breakfast we made our way off the ship meeting Ann & Al and Gail & Tom along the way. We took the Princess shuttle bus to the world trade center. Then it was off to stroll La Rambla promenade checking out the shops and head toward the large city market full of fresh vegetables, fruit, candy, baked goods, meat and fish. It is similar to many European City Markets. After the market visit it was off to visit the old sector of town walking by the Cathedral, the line was too long, and then seeking out a Tosca shop for lunch. The menu was complete with over 35 choices, we collectively selected 10 different ones, ranging from calamari to ham and beef. Of course there also was the obligatory wine and beer to top it all off. On the return to the ship Cindy and Gail had their photos taken with the street mime, he was really good! 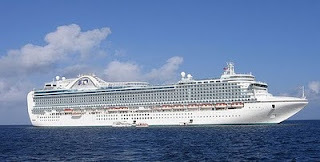 Well, 6.2 miles later we were back safely in the arms of the Ruby Princess. As we departed Barcelona the sea gulls followed close behind as if to say bon voyage to the Ruby as she leaves for the Caribbean not to return to Barcelona, until next spring. Today is a welcome sea day, we are not doing much today, just resting up a bit. Just had a great pub lunch in the Wheel House Bar, they do this on sea days. It is great fish and chips. Today’s big event is going through the Straights of Gibraltar, and me posting this blog,, we will see what happens first. We passed through the straight at 7pm as thr sun was setting. We also placed a note in a wine bottle and placed it in the sea as we exited the straight. The evening clouds and weather closed in as we departed for diner. While at diner the seas became heavier and heavier and it was slightly challenging to return to the aft of the ship. We awoke about 0400 to a heavy thud, not sure the size wave, we were in the north Atlantic and we were welcomed by the sea . It was a rough night with all the folks awakened by the sea. With sunrise the weather cleared and the seas became calmer. We passed under bridge to enter Lisbon’s harbor and docked at noon. After a slow disembarkation process all the tours rushed to make to most of our 5 hour stay. We boarded our private tour to Sintra to visit the castle located on the mountain top, Park and Palace of Pana. It was built in the 19th century and was last occupied just prior to WWI. After the palace tour we returned to Lisbon and stop at the infamous cookie shop for espresso and cookies. Then it was back to the ship to begin the long voyage across the Atlantic. Leaving Lisbon, is beautiful, once again going under the bridge, and this time from our cabin, in the aft of the ship. This is the first of many sea days as we begin our track across the Atlantic. The weather and sea state forecast was for mostly cloudy skies and 7 to 17 foot swells with periods of 13+ seconds. Fortunately the swells were head on so the motion was simply up and down. Not to hard to navigate down the corridors of the ship. We spent a majority of the day attempting to gain connectivity with our computers. By the time we quit, it was time to shower and dress for formal night. The chiefs were preparing a rack of lamb for us in the main dining room, wow was it terrific! It was a excellent evening. We arrived on schedule 10am at Ponta Delgada, on the island of San Miguel, the largest of the Azores. We took a personalized van tour of the north and south coasts of island. Our first stop was at a large grocery store similar to a Walmart complete with underground parking. It was really nice. We stopped there to purchase port wine and of course cheese which the islands are famous for. The market prices are better than the tourist shops. The cost of this island is spectacular, you would think you were in Ireland, it is one of the best kept secreats of Europe. We proceeded on our way stopping in the middle of the island at Furnas, site of the many volcanic mud pots. We stopped to see our meal being cooked in the volcanic mud and then proceeded to a restaurant. As we were returning our guide stopped at a roadside rest and cut open a fresh pineapple for all of us. Wow and double wow! By far the very best pineapple we have ever had. Even the main stem within the pineapple was tender and sweet. It was fantastic. Then it was back to the ship where we held a small sail away party for our van partners. Ordered 2 pizzas and of course we had the wine and beer. We sat on the deck and watched as we sailed away for our next 6 days across the Atlantic. The captain has warned us that the swells will be rather high and the weather not so wonderful. This thirty day cruise has had some interesting weather. All the folks left about 830pm and we decided to call it an evening. We have turned back the clock for the third day in a row as we transit the Atlantic. Happy Halloween! We were greeted with morning dark gray skies and rough seas with 17ft swells. Just the type of day you wish to curl up with a book on the couch. We went to our regular breakfast at Sabortini’s Restaurant and then took some time to trouble shoot our computers. Cindy’s Ipad 2 is doing great while our little Eee PC is having its problems connecting. Of course that is what we were using for our Blog posts which are all in Word. We skipped lunch to get ready for the Cruise Critics Halloween party at 1500. It was great, our costumes worked and several folks did not recognize us. What fun! We stayed at the Sky Walkers lounge until diner and then joined the group for diner. We slowly made our way to Club fusion at 9pm to join the Princess Halloween Party, dancing, and parade. Excellent Halloween party, we entered the parade and danced the evening away! Fun, fun!!! Halloween is the best for parties!!! The connection was not good, so I am finishing this trip now,,, in 2012 here are pictures of some of the sea days, and our docking in Fort Lauderdale, in the wee hours of the morning, it was a wonderful cruise, and we had a grand time, as much for the people we cruised with as where we cruised… we will be doing part of this cruise again in the fall 2012 and then again in 2013, so I guess you could say we like this itinerary. We drove home, from Florida, and our next cruise was on the ferry accross the James river and then we were home. It was wonderful, but it was good to be home too, and the trees were in there full fall color!